53 artists out of 2,557 entries from 80 countries have had their portraits selected for the 2016 Annual Exhibition of the BP Portrait Award. 439 (17%) of the original entries made it through to the final judging session at Trinity Buoy Wharf. the final step was the selection of the final 53 for the exhibition (representing 2% of the total entry). You can see their names - plus links to their websites and a short summary of their CV below - organised by the country where they live at present (when available). If anybody spots a mistake with a website please let me know via comment or contact me. My congratulations to all those who have been selected. SELECTED ARTISTS ARE INVITED to send me a copy of the image of their selected work - to feature in this blog post - along with a copy of their confirmation email. See the side column for how to contact me. ....but first the story of one selected portrait by an artist I've been following for a while. I'm delighted to see Jane Gardiner has a portrait in the BP - especially given the challenge of recent surgery! "Last May I knew I wouldn’t be able to paint for extensive periods after carpal tunnel surgery, so asked for people to come and sit in the weeks after to get reference material to work with once the hand was fully recovered. I was looking to explore how people use props to tell stories about themselves and provided a range of crowns/ears/masks and so on that I’d made for them to choose between at each session. Julie is a landscape artist (which might partially explain the landscape format) based near Glasgow whom I had met several times through mutual friends/ at openings and had long wanted to paint, so I was delighted when she volunteered. She was a terrific model and we had a lot of fun playing dress up. She commented that everyone should wear ears more often and I think would like to have taken them home. During the session I did some sketching and a little oil colour study, as well as taking over a thousand photographs. Once my hand had started recovering enough I did drawings based on this reference material, from which it was clear this pose had potential. However, when it came to making the painting I reversed the tonal graduation as having Julie face into the dark felt more appropriate. The paint was kept loose, neutral and thin except in the lit portion of the face to similarly suggest a process of becoming and change, with the uncertainty that brings. My hand was recovering much slower than expected and later Julie told me it had been a very intense, challenging and cathartic time in her life. I feel that these factors have very much feed into the final painting. It was finished on Christmas Eve, after having delegated the Christmas preparations. There were 1,241 entries from the UK (48.5%) and International Entries 1,316 (51.5%). I do wish the NPG would also provide gender data re the entries. I THINK I'm detecting more BP Portrait Award novices than usual. Maybe a fresh pair of eyes looking at the entries has influenced this? Initially my wife spotted Stewart walking along the street and thought he would make a good subject for one of my portraits. I see many interesting faces every day but approaching someone is far from easy. Stewart was very gracious and agreed to sit for me, he was naturally a good subject. The sitting took place in the one dry corner of my dilapidated barn studio which happens to have the most beautiful natural light. I wanted to make a large work, the figure filling the canvas. I worked the drawing in charcoal directly from the sitter and became particularly interested in the subtle tonal shifts from the face to the background to the coat, the hands locking in a strong triangular composition. Stewart has a tremendous physical presence and I wanted to give a feeling of imminent movement from the paint suggesting a suppressed energy in the sitter. The title ‘Unfolding’ describes the development of the painting and the ambiguous narrative contained within the pose. Richard Burger - born in Italy and lives in London. Studied at Chelsea College of Art and the Art Students League of New York. Got a commission from BP to mark a shipping centenary. Sopio Chkhikvadze - born in Tbilisi, Georgia; studied at Tbilisi State Academy Of Arts. Very little information about her on the web. RBA Annual Exhibition 2016: She won the Michael Harding Award. I saw one of her paintings at this show and found it interesting. Jamie Coreth - Graduated from Oxford (Arch. & Anth) in 2010. Trained with at various schools: the Florence Academy of Art, the London Atelier of Representational Art and Charles Cecil studios. He also has a blog - with some interesting posts - but nothing in the last year. Fiona Graham-McKay - her website declares that she is a painter much in demand and that she has travelled thousands of miles in the last five years fulfilling commissions. This is her blog. Eileen Hogan - Professor in Fine Art in the Camberwell, Chelsea and Wimbledon Graduate School, University of the Arts London. Currently Artist-in-Residence at at the Garden Museum, London until October 2016. I LOVE her paintings! 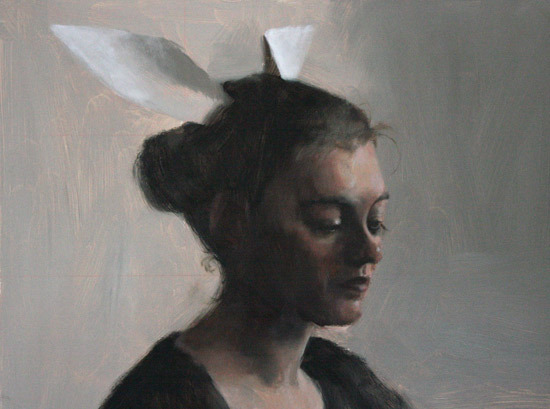 Charles Moxon - Graduated from Camberwell in 2013. Keith Robinson - Paints portraits and office blocks. Has had work selected for a various major art competitions and has exhibited work with the RSPP. Joshua Waterhouse - a hyperrealist artist from Newcastle living and working in London. Studied at Edinburgh College of Art; Graduated with a First Class degree in Art from Aberystwyth in 2014 and studied Art History for a year at the Sorbonne in Paris. I like what I'm looking at with some of the more innovative work in his portfolio. I try to balance my commercial work with personal pieces in which I can immerse myself for much longer periods of time. This painting, for instance, I began in 2009. Its meaning has felt both strong and obscure enough to keep me motivated throughout the whole and scattered process. I started working on it when I was staying at the Norwegian painter Odd Nerdrum’s in Paris. After I had accidentally erased half the picture, I put it aside until the end of 2014 when the feeling of guilt for not finishing it became too strong to bear anymore. There had been several sittings with the model at his home. I made some drawings from life and took some photos – the actual painting was created afterwards in my studio. The background in the painting is where he lives. A beautiful place in the Vosges mountains which is also where I come from. The painting is a combination of his mixed feelings for the place – he loves it but also feels a bit trapped there – and mine. Wolfgang Kessler - Lives and works in Detmold. I suspect his daughter does a lot of modelling for him. David von Bassewitz - a freelance artist and painter based in Hamburg and Berlin. Has won a lot of awards for commercial art. Interestingly both Irish artists are people who moved there from other countries. Miseon Lee - born in Korea and moved to Limerick in 2005. She has been living and working in Dublin since 2011. Selected for BPA 2013 and the Hennessy Portrait Award 2015. She has painted a series of eight self-portraits that make up Lee’s project My Diary that tells different stories of a few weeks of her life in 2010. Gentian Lulanaj - Gentian studied art in Shkoder (in Albania), Rome and Florence and moved to Ireland in 2000 where he opened a gallery on the grounds of Ballymaloe House. Antonio Laglia - lives and works in Rome. Selected for BP Porrait Award 2013. Laura Guoke - a graphic artist who is now a lecturer at Siauliai University Art Faculty in Lithuania. Simon Richardson - a full time artist since graduating from the Otago School of Art with a Bachelor of Fine Arts in 1996. He's fascinated by detail. This is an article about him. Jane Gardiner - an artist who uses a traditional figurative approach to create paintings of people who use props, masks and costumes she has collected to dress up - hence the subject of her portrait has large artificial rabbit ears! Once upon a time there was a little girl who grew up to be a painter and lived happily ever after. Ivan Franco Fraga - Graduated in 2003 with a Bachelor of Fine Arts, University of Vigo, specialising in Painting. Participated in a number of exhibitions in Spain and also internationally. Shany van den Berg - lives in Stellenbosch, Western Cape, South Africa. Has worked as a full-time professional artist since 1992. Brett Amory - lives in California and exhibits on a regular basis. Paints urban scenes with anonymous figures. 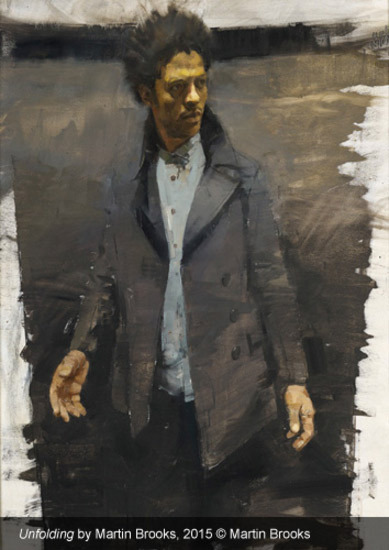 I'll be interested to see what his portrait looks like as his website suggests he is a figurative painter working from photos rather than a portrait painter working from observation. Elena Vladimir Baranoff - Master of Fine Arts in miniature painting from the Palekh Art College. Paints using egg tempera. Selected for the 2009 BP Portrait Award exhibition. 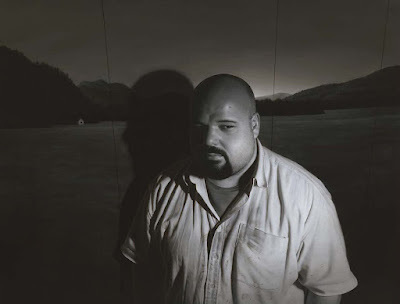 John Borowicz - Lives and Works in South Dartmouth, Massachusetts. This is his blog. He has a diverse way of approaching his art. I'm not sure I'd characterise him as a portrait artist. Noah Buchanan - studied the academic approach to painting the figure in Pennsylvania, California and New York. Received a number of grants and awards. Has exhibited internationally. Joshua LaRock - Graduated in music and then embarked on art studies. Represented by galleries in Cape Cod, New York, Santa Fe, Palm Desert, and Beijing. Below you can see a video of him painting. He's also promising a video of him painting his portrait in the exhibition - which you can see on his Facebook account. Charlie Masson - born in New York. Studied at The School of the Art Institute of Chicago, Camberwell School of Art and the Prince's Drawing School. His website suggests that he not a conventional portrait artist. William Neukomm - Spent more than 10 years as an award-winning designer. Studied in St Louis, Kansas, Art Students League of New York and Florence Academy of Art. Joshua LaRock Fine Artist from Michael Klein Paintings on Vimeo. 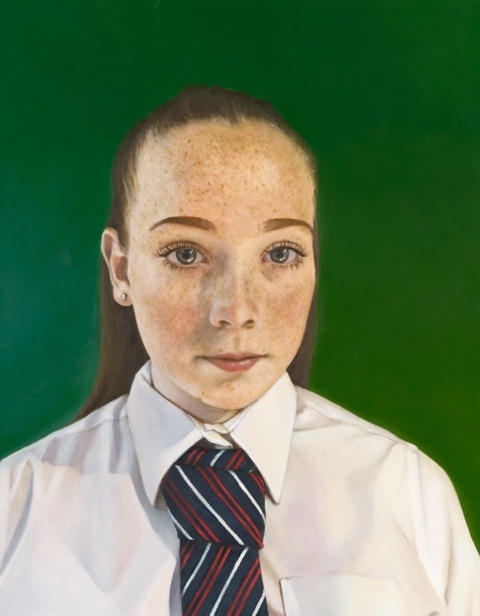 For more about BP Portrait Award between 2007 and 2015 see yesterday's post about the shortlist. So nice to have a nice list for me to nosey everyone else - thank you very much Katherine (and for the top billing!) Really hope every one else sends some pictures in.